A slim cascade tumbling nearly 2,000 feet (590 meters) from a cliff side in the middle of the jungle, La Chorrera is Colombia’s tallest waterfall and among it’s most striking natural attractions, hidden away in the mountains surrounding Bogota. Despite being less than an hour from the capital, La Chorrera is still one of the region’s least visited sights, making it a top choice for those looking to get off-the-beaten-track and the tranquil falls offer the ideal backdrop for adventure activities like horseback riding and abseiling. The only way to reach La Chorrera is on foot and the scenic journey is all part of the experience – an easy 1-hour hike from the nearby El Chiflón waterfalls, winding through wild rainforest trails and misty cloud forest, and offering impressive views over the Colombian Andes. La Chorrera is located around 45 minutes from Bogota in central Colombia. Admission is free but you’ll need a guide to hike through the rainforest. Take an adventure to the lush forests outside Bogotá on this 8-hour trip to the towering waterfalls of El Chiflón and La Chorrera (the country’s tallest). Join your guide on a strenuous 3-hour-roundtrip hike through Colombia’s majestic countryside to these two falls, enjoying beautiful views along the way. At the conclusion of your hike, take a break for a hearty meal of Colombian specialties in La Candelaria neighborhood in Bogotá or alternately, depending on time and availability, in Choachi. Your voyage also includes round-trip transportation from hotels in Bogotá, plus all necessary equipment, bottled water and snacks. Explore La Chorrera Natural Park on this guided hiking trip from Bogotá. 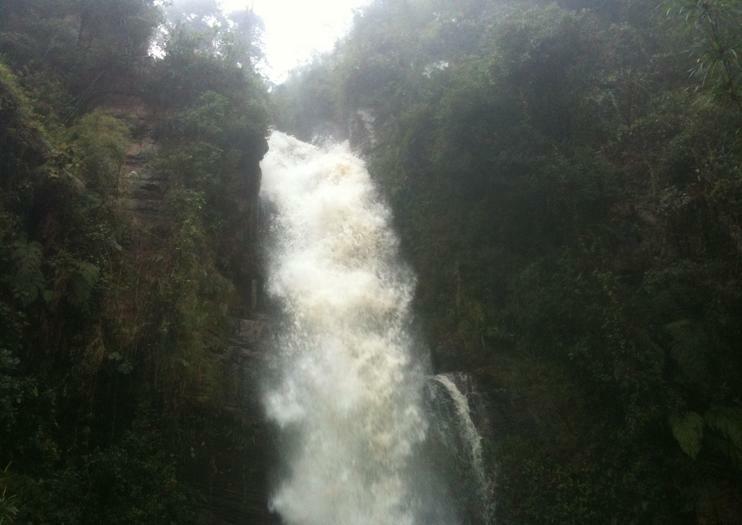 Located in the forest of the Andes mountains, the park features waterfalls and lush landscapes. The hike is suited for hikers with some experience and includes steep, slippery, and rocky slopes. At the end of the tour, head to the town of Choachí, where you’ll be able to enjoy a local lunch (at your own expense). Enjoy the pure air, postcard-worthy waterfalls, and numerous hiking trails of La Chorrera Adventure Park during this 8-hour excursion from Bogotá. Escape the city for some time in nature, exploring this protected area’s 1,900-foot (590-meter) ‘Chorrera’ Waterfall and enjoying its unique plant life during hikes along the park's numerous nature trails.